Beautiful Elm Burl jewelry box, is exceptional in quality of construction and stunning design. Features a gloss finish & scrolled design, spacious jewelry storage, 2 pull out drawers, and fold up lid on top revealing nine sections for earrings, bracelets, necklaces, and rings. 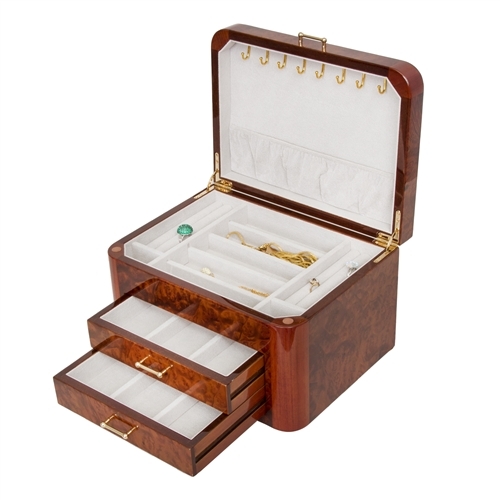 The finest hard wood materials craft this luxurious jewelry box, making a cherished gift that provides the ultimate storage solution for any collection of fine jewelry. 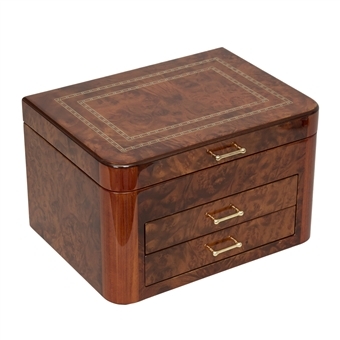 This elm burl jewelry box is manufactured by Jere Wright Global. Optional engraved nameplate available for purchase with this jewelry box. See related products below. I took a chance and I was not disappointed, in the least!